Dealers are offered a space to suit their individual requirements and budget, whether it is a large floor space, a show cabinet, shelf, wall space or an area for an individual item to be shown. 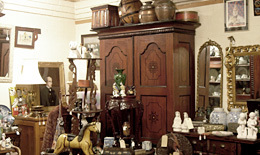 The three members of the managerial team headed by David Burge, all have more than twenty years of experience in the antiques trade and they will be on hand to advise prospective dealers regarding the best use of space and the pricing and description of their items on display. 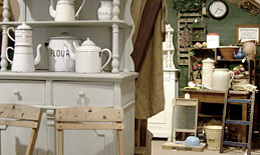 For an affordable monthly charge, goods can be displayed and presented by experienced staff to a constant stream of visitors to the warehouse. There are no additional overheads or bills such as rates, electricity, telephone, rent, staff costs or all the other costs usually associated with a retail outlet. Furthermore, the warehouse is well advertised in the local newspapers and magazines of the surrounding counties. David, Michael or Andy will be happy to tell you more or deal with any queries you might have. Please get in touch - we look forward to hearing from you!